The conical shaped Mt. Hood, the highest peak in Oregon, rises 11,235 feet and is just 35 miles to the south of Hood River. This picturesque board sport hamlet of Hood River is situated on the steep banks of a narrow, lush river valley - the famed Columbia River Gorge. The Columbia River splits two towering icons just beyond the gorge, Mt Hood to the south and Mt. Adams to the north. Hood River: The snow capped, volcanic peaks and the glacial carved gorge beckons the wind, snow, water and board sport enthusiasts. With the possibility of snowboarding 12 months a year, world famous kiteboarding and one of the most innovative skate parks on the West Coast, Hood River takes first prize for the best board sport town in the west. Seasons: Early summer is the best time and offers fresh plentiful snow, warm dry sunny days in the 70s and strong continuous winds from the west. Getting There: Drive 45 miles from Portland on Interstate 84. The drive meanders up the riverbank of the Columbia River Gorge passed basalt columns, historic heritage sites and cascading waterfalls including the popular Multnomah Falls. Snowboarding 12 Months A Year - The "Turns All Year" website recently reported two men tied for the most consecutive months - 126 - with at least one day of skiing and snowboarding. If you think this is extraordinary, simply consider their proximity to Mt. Hood and Mt. Adams, two 11,000-foot-plus snow-capped peaks. Both offer 12-month glacier-free mountaineering ascents and snowboard descents. Mt Hood Snowboarding: If 6,700 vertical feet of climbing is bit overkill for your summer vacation, enroll in a less strenuous, but still adventurous, snowboard camp on Mt. 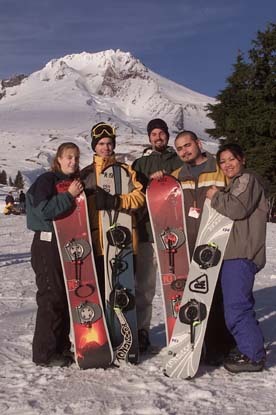 Hood's Timberline Ski Resort. Timberline is the only year-round ski resort in the United States and is a mecca for summer snowboarding. Skiers and snowboarders take advantage of the Palmer Snow Field for summer use. Not to mention, the designer of the 2000 Winter Olympics snowboard park and pipe calls Mt. Hood home and has created the world's best terrain park, and has the pros storming in from around the world to train for the summer. Season: While Timberline Ski Resort operates from October to August, the camps begin offering classes in June and run through mid-August. Earlier in the summer the snow is more plentiful and offers greater amount of terrain options and longer runs. Getting There: Drive 30 miles from Hood River on ORE 35 to the ski town of Government Camp and the entrance to Timberline Ski Resort. Fees: Parking in the Timberline Resort Parking Lot is free during the summer. Summer lift tickets cost $39 per day on limited operation, and adult day camps begin at $150, no-frills 9-day camps for $760, and all-inclusive 9-day camps up to $1,700.